Traditionally, the Japanese sword has been a most important treasure of the Japanese people. We should do what we can to preserve it in order to pay respect to our ancestors who created such a great form of art. Swords must be treated with utmost caution so as not to injure the handler. Precautions to protect them from scratches and rust are also necessary. (1) All swords, whether encased in plain wooden scabbards and hilts (Shirasaya) or formal mountings (Koshirae), need to be kept in their sword bags. The head of the Saya (scabbard) must go into the bag first to avoid the possibility of an accidental fall. (2) To carry a sword, the scabbard (Saya) must be held with one's right hand. The hilt (Tsuka) must be put up and the blade must hang down. This measure will prevent dangerous accidents. (3) Whenever one draws a mounted sword out of its bag or scabbard, make sure the position of the hilt does not go lower than the scabbard. (1) Whether drawing out a Tachi or Katana, one must hold the cutting edge up and grasp the scabbard from underneath in the left hand in a forward holding position. Then, hold the hilt from above with the right hand. Since the scabbard is rather tight fit at the opening where the collar (Habaki) is fit (Koiguchi), the initial pull must be very carefully made so that only the collar's length gets drawn out. 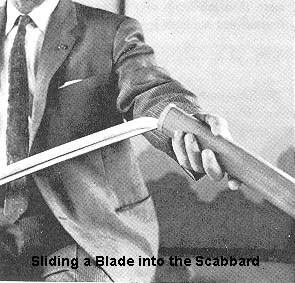 Giving a sudden powerful pull may not only impair the opening of the scabbard but also might result in an uncontrollable jerk leading to injury. Holding the blade still, pull it entirely out of the scabbard very slowly making certain the cutting edge never faces down or sideways. (2) When a blade is placed back in the scabbard, its case must be held by the left hand and the hilt by the right hand as in the pulling-out process. The tip of the sharp edge facing up must first rest gently on the opening of the scabbard. Again, holding the blade still, slide the blade along the ditch into the scabbard. When the collar reaches the opening of the case, a firm push is necessary to ensure steady settlement. As before, the cutting edge must not face down or sideways. The major purpose of sword care is to make the steel surface does not oxidize or rust. Therefore, it is necessary to thoroughly remove the stale oil and replace it entirely with new oil. The following describes the tools used and the order of operations of sword care. B. Mekugi-nuki: A tool to remove the bamboo peg (Mekugi) holding the blade in the hilt; usually made of brass or bamboo. 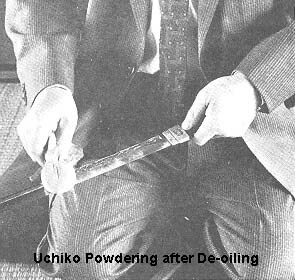 C. Uchiko: The most finely ground and filtered Uchigumori powder for cleaning the blade surface. 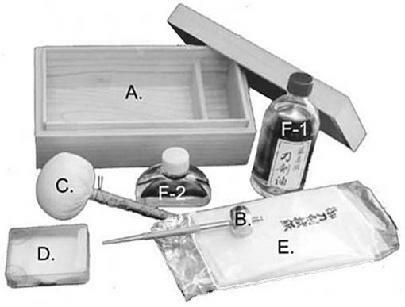 First, wrapped in Japanese hand-made paper called Yoshino-gami, then wrapped by cotton or silk cloth, the fine natural stone powder comes through the wrapping materials when patted on the blade surface. D. Material used to spread oil over the blade surface. E. Nugui-gami: High quality thick Japanese paper must be thoroughly wrinkled to soften and remove coarse and dusty elements for wiping the blade surface. There are two reasons for the wiping function; one for preliminary removal of old oil and the other for removal of the powder. F 1 & 2 A rust-preventive oil called Choji or Clove oil. Others: A wooden hammer and benzene, if necessary. 1. Lay down the mounted blade and push the peg out in preparation for removing the hilt. 2. Pull the blade out of the scabbard. 3. To remove the hilt, hold its end with the left hand on the side where the back of the blade is fit, and keep the blade in a slightly angled upright position. Use the right fist to hit the left wrist lightly a few times. 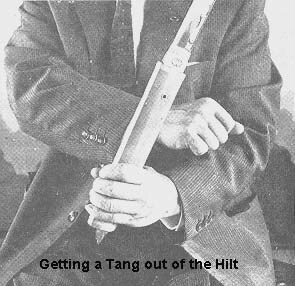 When the tang (Nakago) becomes slightly loosened in the hilt, repeat until the tang comes out of the hilt by itself. When there is enough room to grasp the tang, the blade may be pulled out of the hilt by the right hand. Be careful not to hit the left wrist too hard with the right hand as there is a danger that blades with short tangs like Tanto might bounce out of the hilt entirely. Therefore, the initial impact must be light, just to check how tightly the tang is fixed in the hilt. Then, the force of subsequent blows must be adjusted accordingly. When the blade is taken out of the hilt, the peg removed from the hilt should be replaced. 4. If the blade is mounted in a full Koshirae, other attachments such as sword guard (Tsuba) and spacers (Seppa) on both sides of the sword guard in addition to the collar must be replaced. When the collar is fit too tightly to remove, it can be loosened by hitting it with a wooden hammer on the back (Mune) after covering the collar with a cloth for protection. 5. 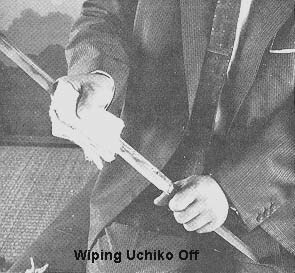 The wiping process requires two pieces of paper. The initial one removes the old oil and dust, which is called preliminary cleaning. First place the cleaning paper on the back and fold it into halves toward the edge. Then, hold the paper-covered blade from above the back so that the thumb and the forefinger grip each side of the cutting section from above the paper. Hardly any force is needed to wipe the blade upward, one way, starting from the base. When the cleaning paper reaches the point, be particularly careful in wiping lightly. No pressure or friction must be put on the point. When expertise is attained, the wiping action can also be both ways, up and down. Lack of experience could cause the cutting of paper or even fingers and thus it must be strictly avoided. 6. In case the oil cannot be removed with ease, cotton or gauze soaked in benzene or pure alcohol may be used in the same wiping manner as described above. 7. The powdering starts from the base toward the tip on the obverse in a light, uniform patting motion to cover the blade surface. Then turn the blade over and start patting from the point download toward the base. 8. Then, use the other sheet of paper to wipe the powder off the blade surface in the same manner as described in (5) in this section. If oil remains, some more powdering and wiping is necessary. 9. When the surface is thoroughly clean, check for the presence of rust, flaws and other damages. Then, without putting back the hilt, collar and other attachments, the blade alone must be placed back in the scabbard. It should be noted that the two kinds of wiping paper used in this process must not be interchanged and should have distinct purposes - preliminary and final. 10. The re-oiling with a piece of paper, or de-starched flannel, folded in size 3cm x 6cm and soaked in fresh oil completes a round of sword care. When the paper is ready, the sword is to be drawn out of the scabbard again. After placing it in the left hand, put the oiling paper on the back to do the same movement as described in the wiping process. To make sure the blade surface is thoroughly covered with oil, repeat the same procedure a few times. Just as in the wiping, the handling of the sword as well as the oiling paper must be most carefully done. The paper should contain the right amount of oil so that no excess oil will overflow and harm the scabbard. The oil must be spread thinly and evenly. 11. It is a good idea to apply oil to the surface of the tang with one's fingers. However, an excessive amount of oil must also be avoided here. 12. Put the collar back and encase the blade tentatively in the scabbard. Remove the peg from the hilt, draw the blade out of the scabbard, hold it in the right hand in an almost upright position, pick up the hilt with the other hand, and put the tang back in the hilt. 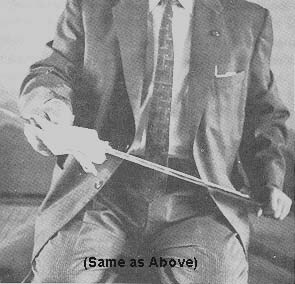 Keep holding the blade in the hilt with the left hand and hit the bottom of the hilt lightly with the palm of the right hand so that the tang settles firmly in the hilt. 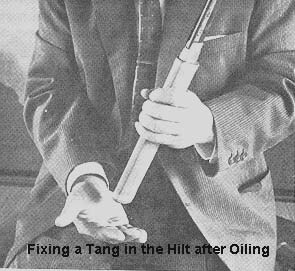 When the tang is fixed in its perfect position, replace the peg. Then, pass the blade to the right hand, pick up the scabbard and slide the blade into it observing the manner described in Section II. Needless to say, the other parts like spacers and sword guards of fully mounted swords must also be returned to their respective places before the hilt is put on the tang. 13. The methods for handling and caring for other forms of blades such as spears (Yari) and halberds (Naginata) are the same. Spears must be handled especially carefully ; otherwise injury may occur. Also, the daggers of double-edged type (Ken) are very dangerous. Sword care tools must be kept perfectly clean, for dust stuck on the wiping cloth or oiling paper could cause scratches on the steel surface. Protecting these surfaces which have been most finely polished through the graded processes involving more than ten kinds of whetstones of different fineness and hardness is critical. The most important aspects of preserving blades in any form are to protect them from developing rust and scratches. 1. Despite regular care and oiling, a blade may develop rust in places. Generally when rusting takes place where the scabbard touches the blade, it must be taken to and repaired by a Saya specialist. Or, when the scabbard is very old, its interior may well be contaminated with rust and dirt, thus causing the steel to rust. In such a case, a new scabbard must replace the old one at once. 2. Since the formal mounting functions as an outfit for dressing up, a blade needs to have a plain wooden scabbard and hilt which would be, as it were, casual wear for a blade. It is much preferred to rest a blade in its casual outfit so that when the blade surface starts to rust the wooden scabbard can readily be cleaned inside by splitting it open into vertical halves, which are simply fastened together with a paste made from cooked rice. No chemical substances may be used to fasten the parts of the scabbard and hilt. 3. If a blade should start to rust, no inexperienced repair such as rubbing the rust off with a spatula or coin's edge would improve the condition; rather it is likely to aggravate it and necessitate extra work in smoothing the damaged area. It must be taken to a polishing specialist at once just like a sick person would need to go to see a medical specialist. 4. Since a blade is particularly vulnerable to rusting soon after polishing, cleaning and oiling should be done preferably every ten days for about six months. 5. Later when the polished blade surface condition is more stable, clean it regularly, at least every six months. 6. In preserving swords, it is improper to keep them in a leaning position because it would cause the oil to go down along the blade surface and make a pool at a point. It is necessary to keep them in a dry place, laid down. It would be ideal to keep them in drawers made of Palonia wood. Use of camphor (moth balls) to protect the chest from wood borers should be avoided. It would cause rust on the Steel. 7. Although dry conditions are preferable for swords, the wooden containers or mountings require moisture. Therefore, the place for preserving swords must be carefully selected.